I adore balsamic vinegar — the stronger, the better! You should never let me be in charge of pouring oil and vinegar for your bread, because I’ll dump out a pool of balsamic with a teeny tiny droplet of olive oil on top. 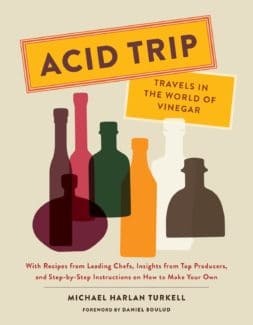 So I figured Acid Trip, a book-length love letter to vinegar, would be perfect for me. As a foodie memoir, this book is at its best. The author’s travels are divided by region, including Italy, France, Austria, Japan, and North America (the largest section). 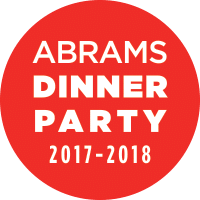 He meets with chefs, manufacturers, and experts who share their passion for vinegar — and their recipes. The chapter on Italy goes into detail about the official appellation for authentic balsamic vinegar and why it’s worth the jaw-dropping prices. My favorite chapter was on Japan, where vinegar has a long history as a preservative for fish in the pre-refrigeration era, and where, as you might expect, vinegar enthusiasts are deeply passionate about their unique regional varieties. As a cookbook, Acid Trip is less successful. The recipes span the globe, and include savory and sweet, some cocktails and shrubs, and even a guide to making your own vinegars. Some of the author’s own recipes are a little weird (pickled sausages?). You’ll find everything from Japanese ceviche to chimichurri chicken wings to vinegar pie. But the recipe I tried first was pretty much a disaster. I love seafoam candy, but had never made it, and hadn’t realized it uses vinegar (the reaction between vinegar and baking soda causes the dramatic inflation that gives the candy its light, airy texture). My first batch looked right, but smelled burned. My second attempt — during which I watched my thermometer like a hawk — flat-out scorched. Googling in frustration, I realized that every other seafoam recipe in the world calls for medium heat, precisely because high heat will burn the sugar — but the Acid Trip recipe specifically directed to cook the syrup on high. My third batch, cooked on medium heat, didn’t burn… but it failed to fluff up properly and came out unpleasantly dense and sticky (maybe due to the honey, which other recipes don’t call for). With such a basic error in a simple recipe, I’m now skeptical about spending money on costlier ingredients for the other recipes (having wasted a bag of sugar and half a jar of honey on this one). Maybe I’ll try the Fried Egg with a Spoonful of Vinegar to build trust. If you enjoy food writing or have a love of the sour and pickled, this is a fun and attractive coffee table book, and certainly pretty enough to give as a gift to your favorite vinegar lover. But I think I’d keep it out of the kitchen.